Silk Cotton Villa was rebuilt after Hurricane Hugo pretty much destroyed it in 1989. Hurricane Hugo was a powerful Cape Verde-type hurricane that caused widespread damage and loss of life in the Leeward Islands, Puerto Rico, and the Southeast United States. The Villa was then a two bedroom house. Since the storm damaged it almost to the ground, the owners decided to enlarge it when they rebuilt and turn it into a large rental villa. They added two upstairs bedrooms and raised one bedroom so they could get another under it. In addition, they did some modifications to the “owner’s” apartment including enclosing an attached outdoor porch and making it part of the enclosed living room adding a very nice amount of floor space as well as a whole wall of windows. That porch and its drainage holes is the subject of this post. Being that it was an outside porch at one time, it had four (4) drainage holes at the bottom of the exterior wall to allow water to drain off of it during storms. For some reason, during renovations, no one thought to close these drainage holes that went through 12″-16″ of concrete wall. 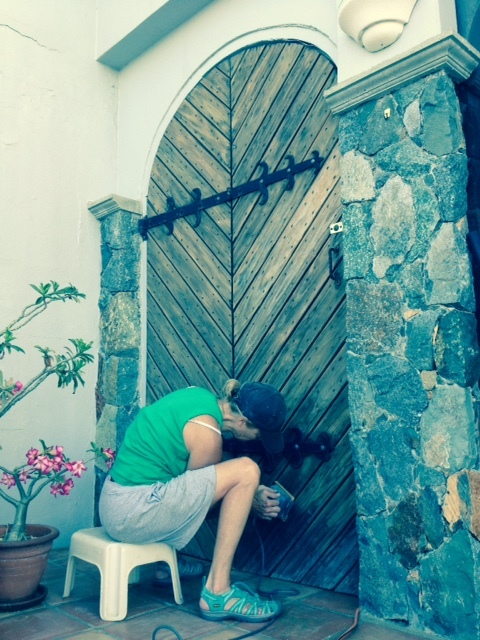 When we arrived this past summer, the owners indicated that a lot of critters, especially iguanas and lizards, have a tendancy to come into the villa through these openings. In due time, closing these drainage holes made it to the villa project list. And the project made it’s way to the top of the list last week. Dumb me forgot to take “before” images so you will have to use your imagination looking at the photos below to envision what I am explaining. With a little “MacGyverism” to make a hole plug, some fiberglass tape, and some concrete vinyl patch, I think it came out pretty good. I also think I could do a better job the next time around. I haven’t used concrete patch in the past so it was a learning experience. Not bad for a rookie, IMHO. Now the critters have four less places to get inside – LOL. One more project checked off the project list! This entry was posted in Caretaker in the Virgin Islands, Couples Jobs, Project Lists, Property Caretakers, Silk Cotton Villa, Working Couples Jobs on November 24, 2014 by Richard Arnold. Behind on posting … again. Guests are here this week. Arrived last Wednesday and depart this Wednesday. So, week before last was finishing up a big project and generally making sure everything was in “Show Ready” condition for the guests. 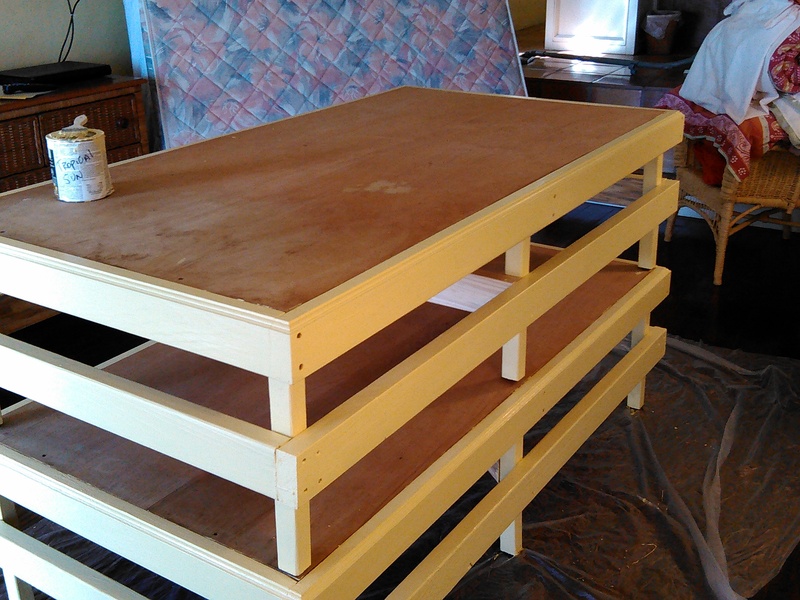 One of the guest bedrooms has a homemade platform for its King size mattress. I suspect the platform was constructed many years ago, maybe when they opened in 1994 or so. 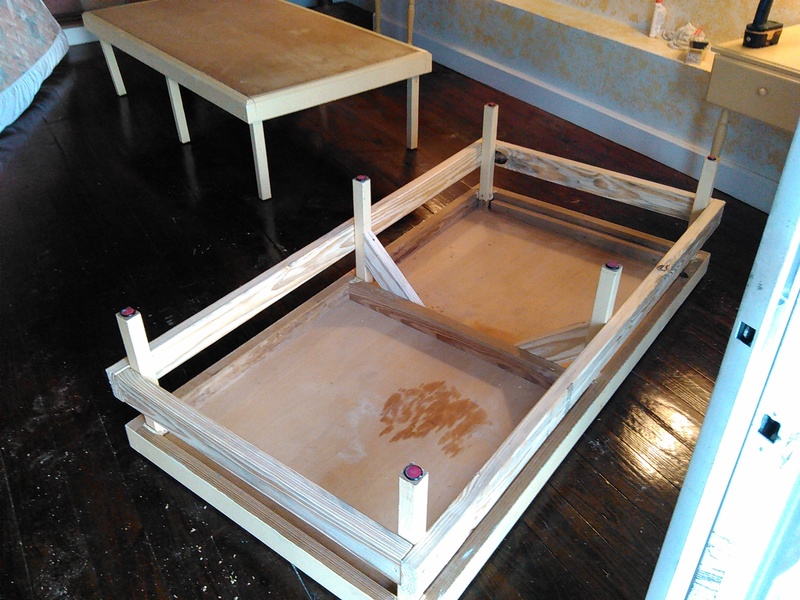 The platform is in two sections – made entirely of plywood, 2x4s, and 2×2 legs. Over the years of use, the leg mounts have become loose causing the whole thing to squeak badly when moving about on the mattress. Even a turn from side to side would wake the dead. 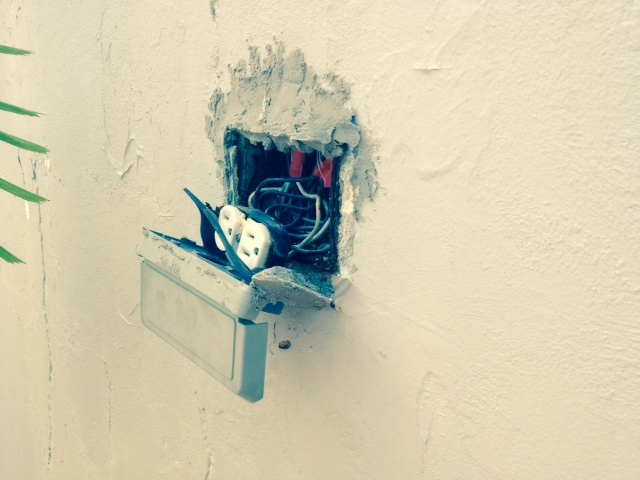 Glad we slept in every room to see if anything needed fixing or repaired. This definitely did. My “fix” was to add an additional 2×4 support all the way around the legs of each section and run some new screws into the legs where they were orginally mounted. Not a difficult job, just a little time and patience to do it right. Of course, once the construction was done, it needed painting. I decided to paint the whole thing and freshen it up. Turned out fine. And it’s tight as a tick …. no more squeaking. 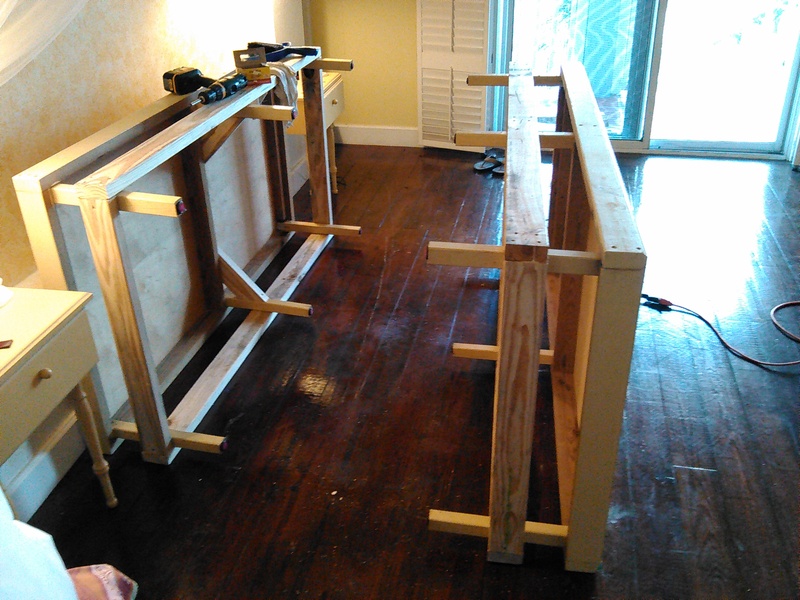 Final Note: We added plastic glides to the bottom of each leg so we can move the platform away from the wall easily for cleaning and making it up. With guests here project work goes on hold. But we’ll be back at it in a few days. Stay tuned. And everything gets covered by a bed skirt. 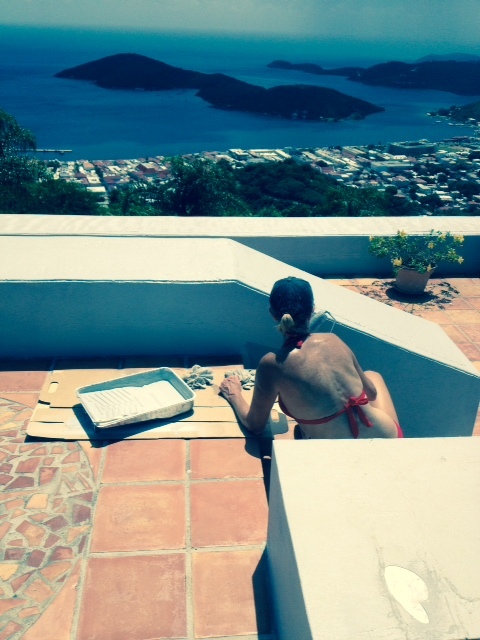 This entry was posted in Caretaker in the Virgin Islands, Couples Jobs, Property Caretakers, Silk Cotton Villa, Villa in St. Thomas USVI, Working Couples Jobs on November 10, 2014 by Richard Arnold. Note: I’m about 1.5 weeks behind on posting. I apologize. 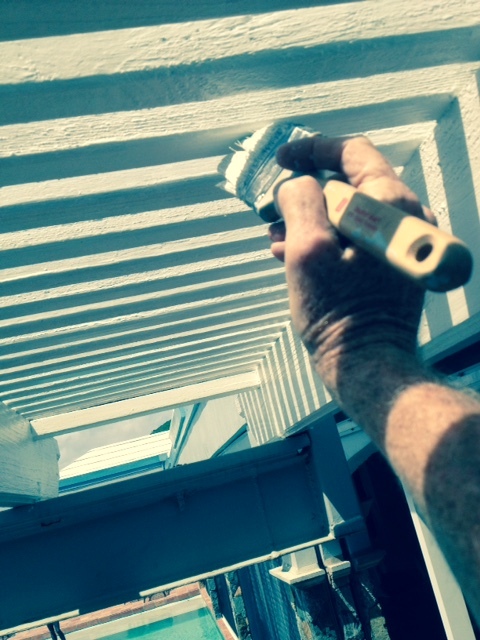 I started painting the Pergola on Monday, October 06. I finished Friday, October 10. It didn’t take 5 days, all day. I painted some each of those days. It was hot. It was humid. I was sweating like a pig. I took a lot of breaks. I drank lots of water. I took lots of swim breaks. Actually, I got the painting of the white slats done by Thursday mid-morning. Just time-consuming work getting between all of those slats and looking up into the sky and sun – it was tiring work (I know, cry me a river – boo-hoo). But damn, it looks good once it was done! 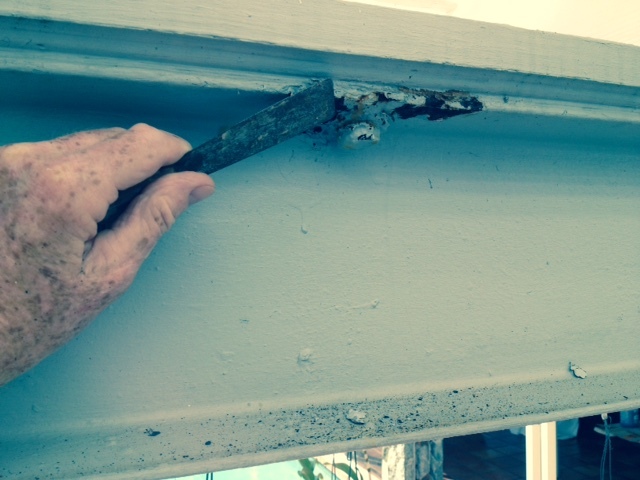 Then I had to work on the rusted areas of the steel beams holding all of the slats up. Here, you have to scrap and pick and pull the old rusted painted areas and then coat them again with a rust inhibitor product. This product turns the rust black and prepares it to be painted. It had to dry overnight. 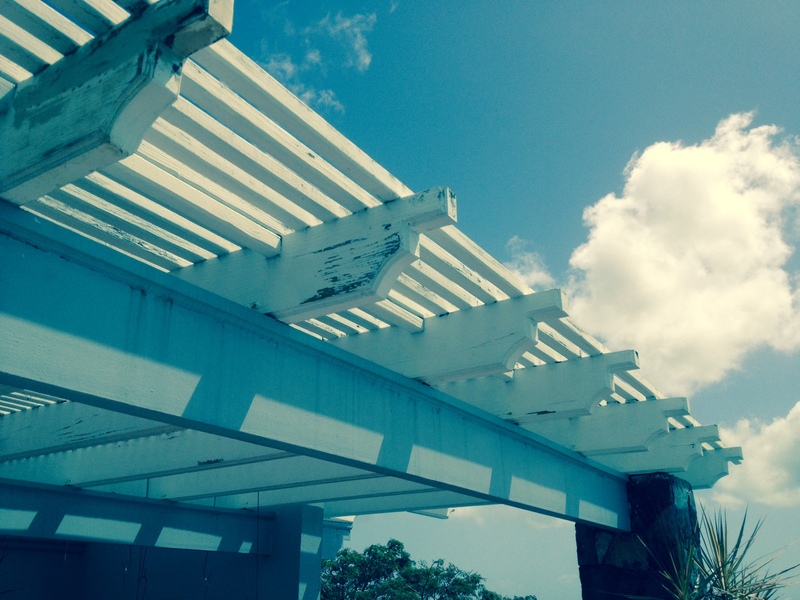 Friday morning was “paint the steel beams day” and the day we end this project – yeah! Had this done by lunch and had a celebatory beer and swim in the pool. The Pergola area looks nice and clean now and ready for guests. 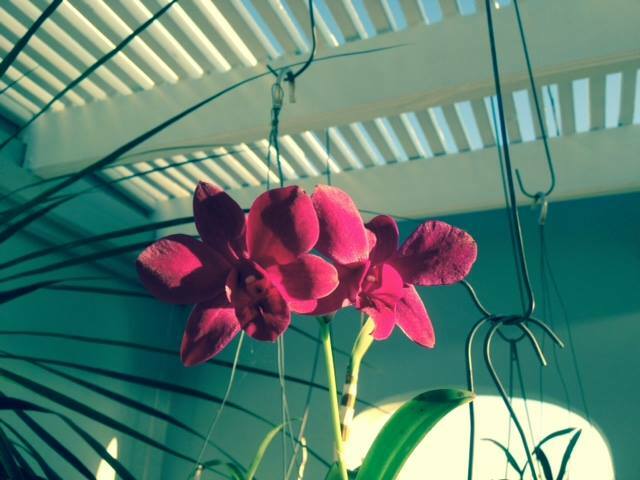 Plus, the orchids now have a pretty place to bloom. Guests in for a week and then a couple of more weeks of small projects before more guests arrive in early November. Updates coming soon. 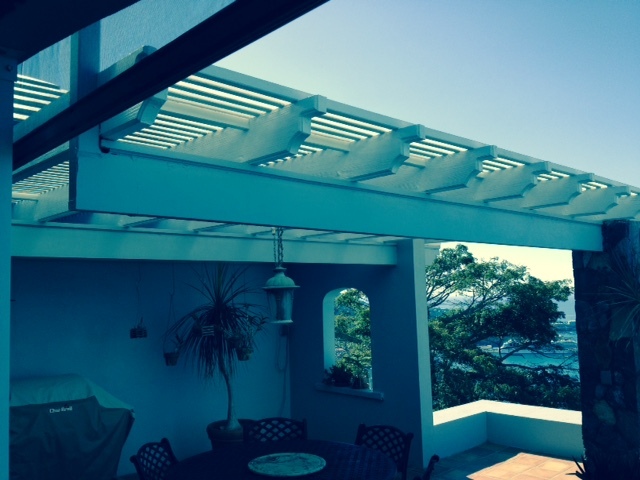 This entry was posted in Couples Jobs, Painting a Pergola, Project Lists, Villa in St. Thomas USVI, Working Couples Jobs on October 26, 2014 by Richard Arnold. The Pergola project has been staring us in the face for some time. 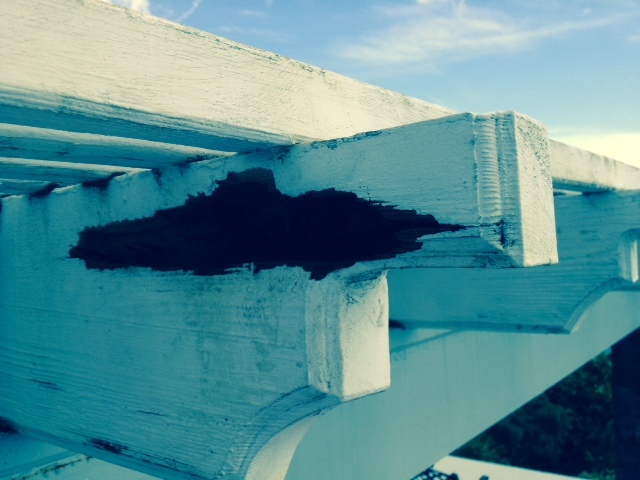 It got delayed a bit when we discovered a fairly large rotten area in one of the Pergola’s large wooden beams. Of course, this rotten area had to be properly repaired before we could pressure wash and then paint. Going into last weekend, the wood repair was completed and finally dry. Tme to pressure wash the entire Pergola. 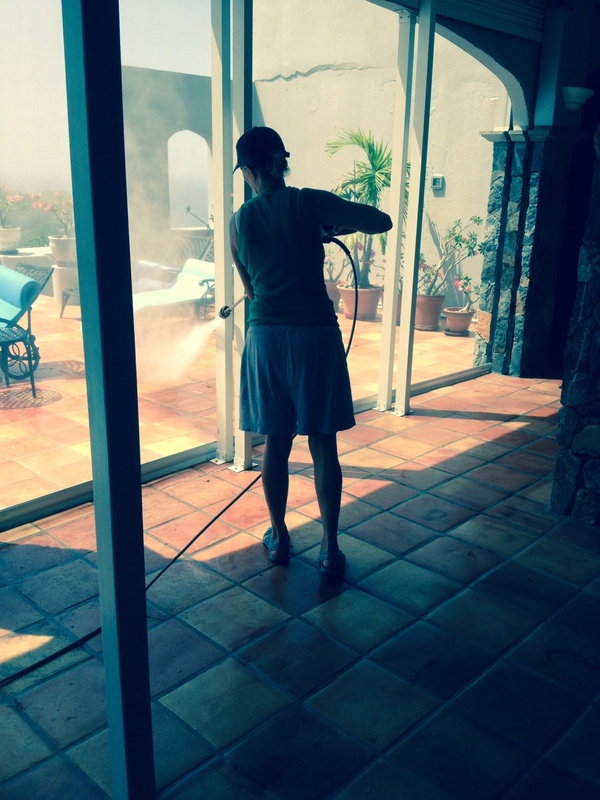 Sharon is the pressure washing Queen. I think she likes doing it. Plus, since she had to shoot up to get the Pergola beams, she got soaking wet. Not a bad thing in 90°+ weather. Once she finished the Pergola (old paint chips went everywhere), we cleaned the outdoor wrought iron furniture and some dirty areas around the pool patio. 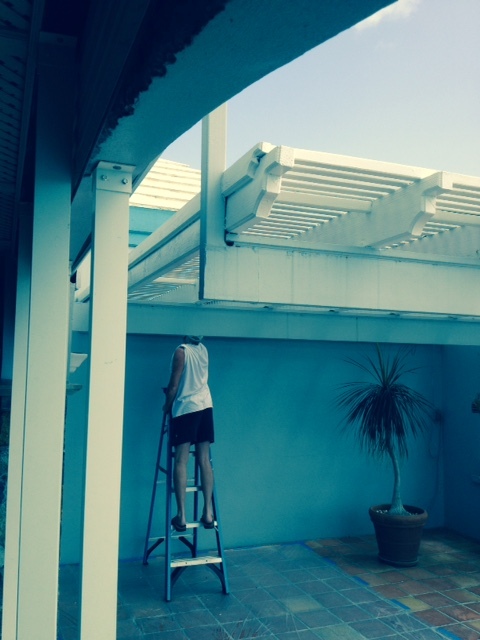 Then, Sharon decided to see if she could clean the big rollup screens along the pool without damaging them. She tested and it worked. So she got all five of the big screens nice and clean. Not often you can pressure wash from the inside of your home. The last area we needed to pressure wash was the front entrance patio and some really dirty areas on the driveway. Guests are coming this weekend so we want it to look nice and clean. And it now does. So another project week in the books and the Pergola is ready to be painted. I’ll cover that project in my next post. 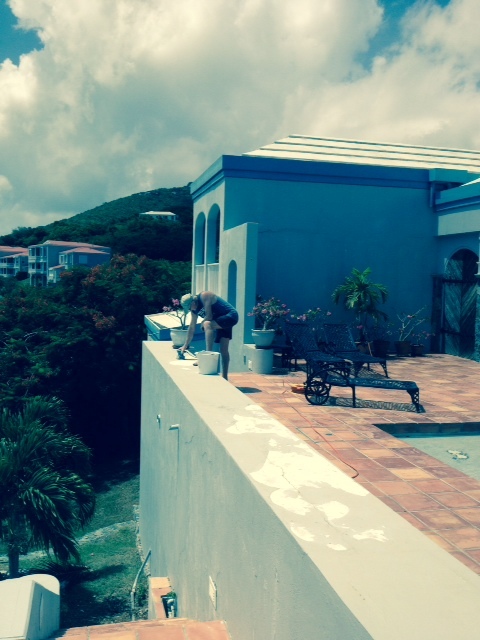 This entry was posted in Caretaker in the Virgin Islands, Couples Jobs, Property Caretakers, Working Couples Jobs and tagged Pergola Cleaning on October 10, 2014 by Richard Arnold.